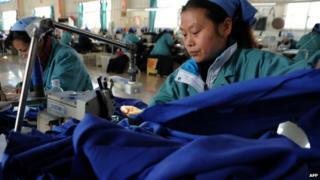 China's move to cut its growth target to 7% in 2015 from 7.5% last year has grabbed headlines, but the key number is the unchanged job creation target of 10 million. During the annual meeting of China's legislators, Premier Li Keqiang set this year's GDP growth target at around 7%, which is the slowest in a quarter of a century. This is after last year's growth target was slightly missed at 7.4%, but the introduction of the qualifying word in the target meant that the Chinese leadership is moving away from a strict target in any case. Correspondingly, the inflation target was lowered from 3.5% in 2014 to 3%. But the targets that remained unchanged were the ones related to jobs. China is maintaining its unemployment target of 4.5% and the aim of creating 10 million jobs per year. Unlike the GDP target, this was exceeded last year when more than 13 million jobs were created despite the slowing economy. Creating jobs for the millions of graduates each year and ensuring that the new middle class is not suffering from high unemployment are obvious goals for a system without the safety valve of an election. Still, it also reflects the aim of China to shift down a gear in terms of growth and focus on improving the quality of that growth. So, instead of investment-led expansion of the economy, the now larger services sector is more labour-intensive. Rather than building more ghost cities, output expands to provide services to the new middle class. And services provide employment along the low and the high ends of the skills spectrum. Consumption has risen sharply since the height of the global imbalances when it was a mere 35% of GDP, and services are a larger driver than manufacturing of economic growth. These are positive signs, but they don't mean that the problems of debt in real estate are not lurking. I spoke to a property developer in Shanghai who said that even in the relatively insulated major cities of Shanghai and Beijing the occupancy rates of commercial office buildings were lower than before. Before the global financial crisis, it took eight to nine months to reach 95% to 100% occupancy. Now, the building that he took me to see was just half full after two years. When I asked if slowing growth was a worry, since that could hit the pockets of potential tenants, he said that it wasn't. Although developers in China are leveraged as elsewhere, he said that interest rates are low and lenders have creative ways of ensuring that there aren't bankruptcies by offering longer repayment and other terms. It suggests that there are more potentially non-performing loans that are hidden than the official statistics indicate. Indeed, last weekend, China cut interest rates for the second time since November. Last month, they also cut the reserve requirements for banks, which was the first such industry-wide cut since 2012. These moves to keep the easy money flowing aren't exactly reassuring as they imply China needs to stimulate the economy to meet the lowest growth target in 25 years. I also heard from various entrepreneurs that venture capital money was abundant in China. Newly rich Chinese and overseas investors were piling into China aiming to fund the recent spurt of start-ups. Some even said that venture capitalists can support property companies, although a prominent venture capitalist told me that wasn't allowed. The reliance on cheap cash to keep the property sector afloat has a worryingly familiar ring. However, there also appear to be more entrepreneurs too, and the Chinese government will hope that these will be a greater force in the economy than the overhang of debt from the old growth driver. That's why the employment figures in China are the key ones to watch for, and the policies the legislature announces in the coming days to support that aim will be more important than the headline GDP figure.